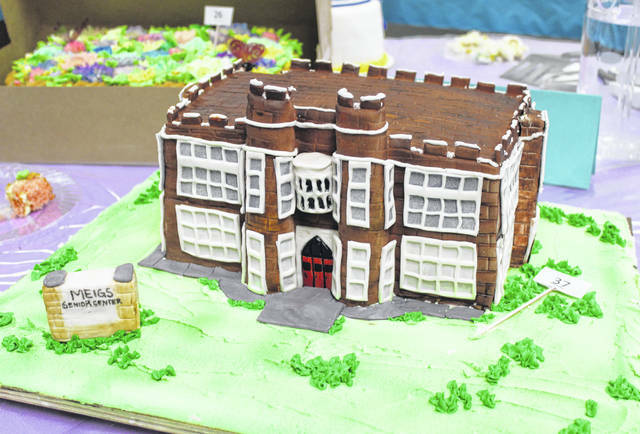 The Future Home of the Meigs County Council on Aging cake was made by Samantha Wolfe for the decorated cake division. 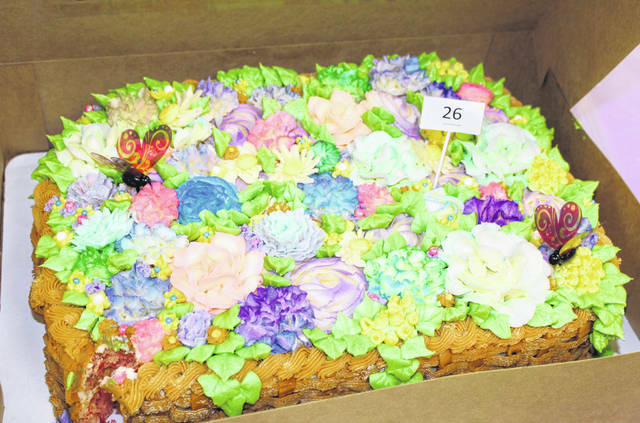 The Spring Flower Basket cake was made by the Mason County Action Group for the decorated cake division. 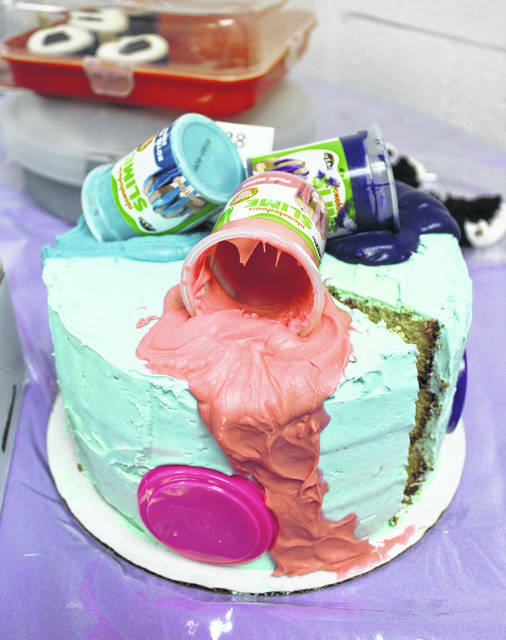 The Marshmallow Slime Cake was made by Kinnedy Stanley in the Age 12 and under division. 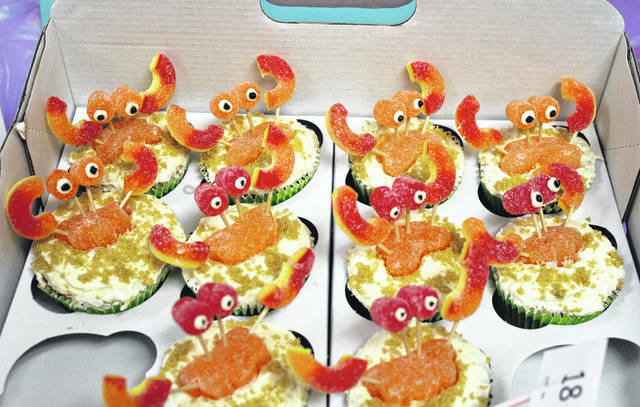 The Crabby Cakes were made by Lauryn Woodall in the Age 12 and under division. 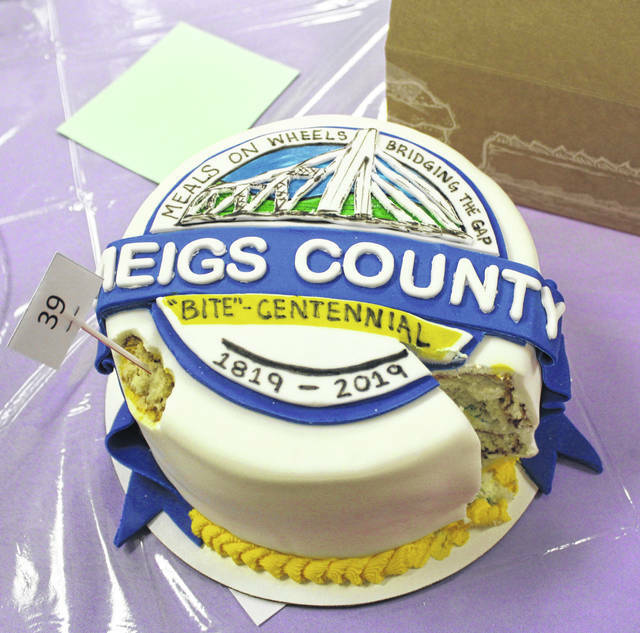 The Meigs County “Bite-Centennial” cake was made by Sammi Mugrage in the decorated cake division. 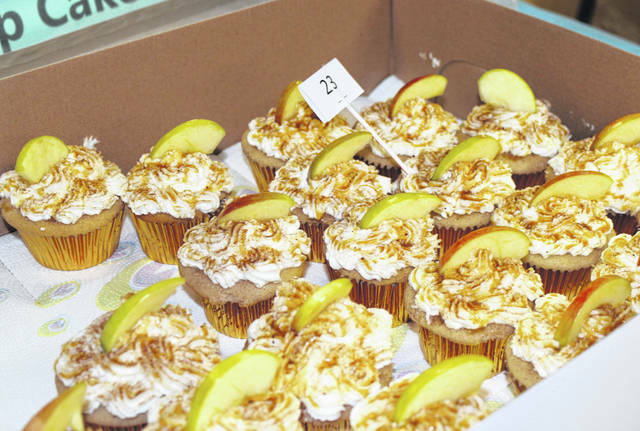 The Apple Pie cupcakes were made by Rita Ball for the cupcake division. 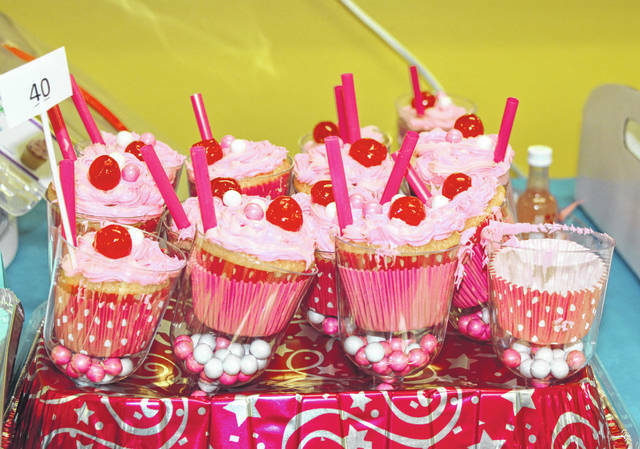 The “Kinki Pink” cupcakes were made by Jenni Doczi for the cupcake division. 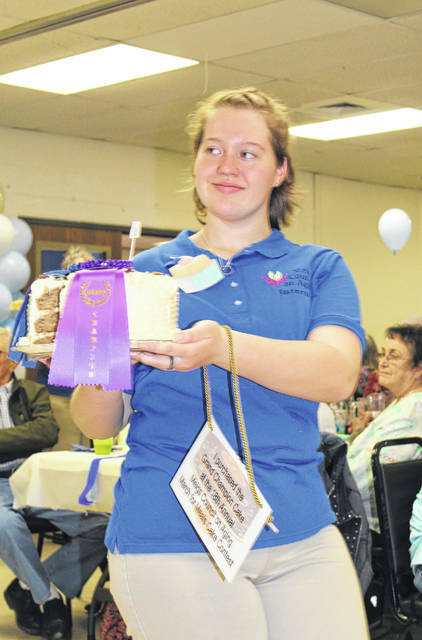 Raeven Reedy displays the Grand Champion cake made by Jean Powell. 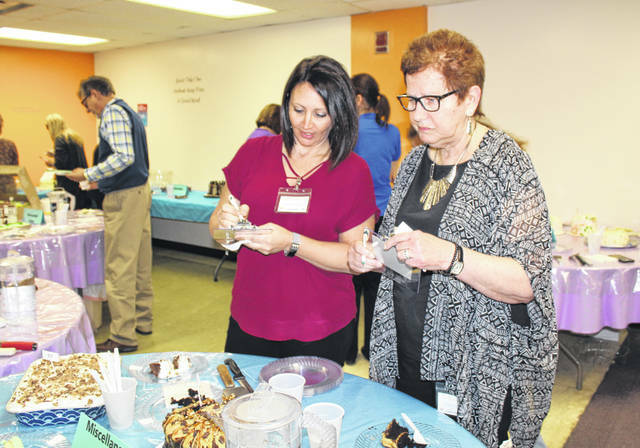 Sammi Mugrage and Barb Crow were among the cake judges on Thursday evening. Kevin and Lois Oiler judged the cupcake division. 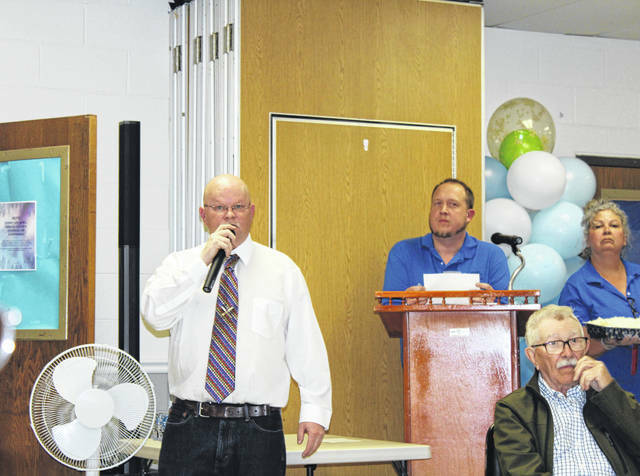 Auctioneer Billy Goble had the job of auctioning off all of the cakes. The proceeds from the auction benefit the Meals on Wheels program and the kitchen renovations at the new location. Cake judges Mick and Marge Barr taste one of the entries. Bill Quickel looks over the cakes in the decorated category. 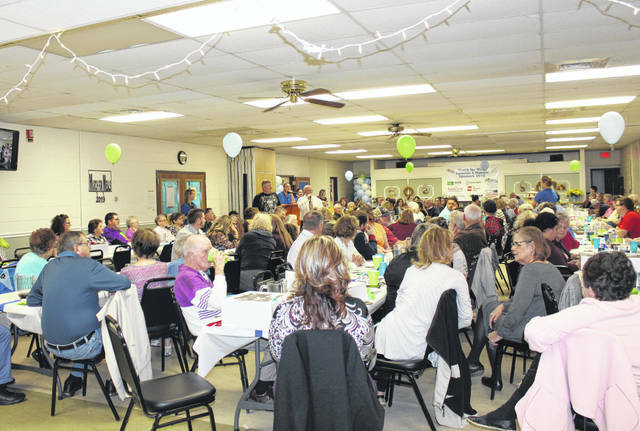 A large crowd gathered for the 18th annual March for Meals fundraiser on Thursday evening. 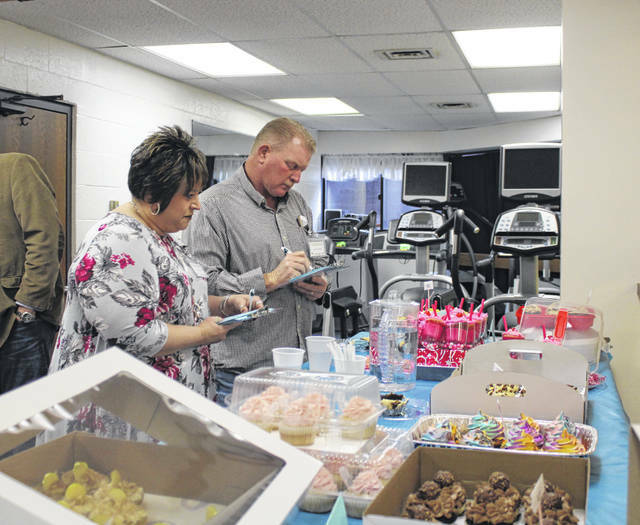 POMEROY — A total of 40 cakes were auctioned off to benefit the Meigs County Council on Aging and the Meals on Wheels program during the 18th annual March for Meals fundraiser held on Thursday evening. March for Meals is held to promote the local programs and to educate the public to the importance of good nutrition for older adults. Current statistics indicate that one in six Americans over the age of 60 does not have enough proper food to eat for optimum health. It is likely that it is much higher than one in six in the local, Appalachian area. For many years the Council on Aging has celebrated the nationwide event by holding a dinner and cake contest. Cake bakers can choose from seven cake categories, including one category for children 12 and under. Cakes are judged and then auctioned with the proceeds going to the local Meals on Wheels program operated by the Meigs Council on Aging. The Grand Champion cake was a Hummingbird Cake made by Jean Powell, with the Reserve Champion being the Double Fudge Hazelnut cupcakes by Mandy Milliron. The Director’s Award went to the Mason County Action Group for their Spring Flower Basket cake. Age 12 and under — Eva Enslen, first place, Reese Cup Cupcakes; Kinnedy Stanley, second place, Marshmallow Slime Cake. Cake bakers for the event included Betty Farrar, Samantha Wolfe, Amanda Saxon, Carolyn Garnes, Kinnedy Stanley, Sammi Mugrage, Jenni Doczi, Christina Richards, Annisha Ball, Lauryn Woodall, Lori Miller, Stacy Butler, Addie Matson, Rita Ball, Raeven Reedy, Mason County Action Group, Peach Mugrage, Kyra Zuspan, Karen Circle, Terri Cline, Rylie Wolfe, Linda Marie Rapp, Beth Pierce, Mary Morton, Jean Powell, Carol Tate, Ashlee Enslen, Eva Enslen, Tracy Davidson, Mandy Milliron and Alyssa Richards. 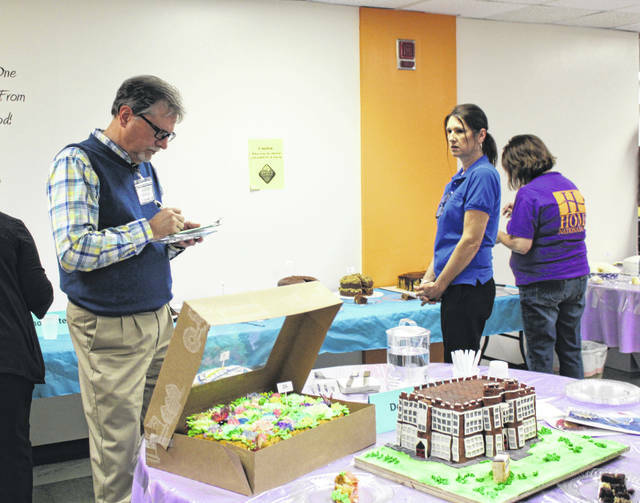 Following the judging, cakes were auctioned off to the highest bidder. Buyers at the event included Swisher & Lohse, Farmers Bank, Home National Bank, Transitions Home Care, Shear Illusions, Oiler Livestock, Erin Cross – Shear Illusions; Beth Shaver, Commissioner Jimmy Will, John Matson, Larry Wiley, Ridenour Gas, Judge Linda Warner, Clerk of Courts Sammi Mugrage, Dog Warden Colleen MurphySmith, Barb Crow, Wild Horse, Shannon Miller and the Vaughan Agency. Cake Judges for the evening included Lori Miller, Barb Crow, Marge Barr, Mark Porter, Bill and Lesa Quickel, Mary Byer-Hill Mick Barr, Lois and Kevin Oiler, Sally Hanstine, Steven Fiegel, Jenny Mayle, Sammi Mugrage, Angie Shamblin and Brenda Smith. Event sponsors included AEP River Transportation, Smith Construction, Farmers Bank, Home National Bank, Mark Porter Auto Group, Transitions Home Care, REMRAM Recovery LLC, Swisher & Lohse Pharmacy, D.V. Weber, PDK Construction, McDonald’s of Pomeroy, Angell Tax Meigs, Racine Optometric Clinic, Dr. Douglas Hunter, Auto Options, Jack’s Septic Service, Shear Illusions, Subaru of America, Oliver Packing and Equipment, King Ace Hardware, Hill’s Classic Cars and Pomeroy Flower Shop. 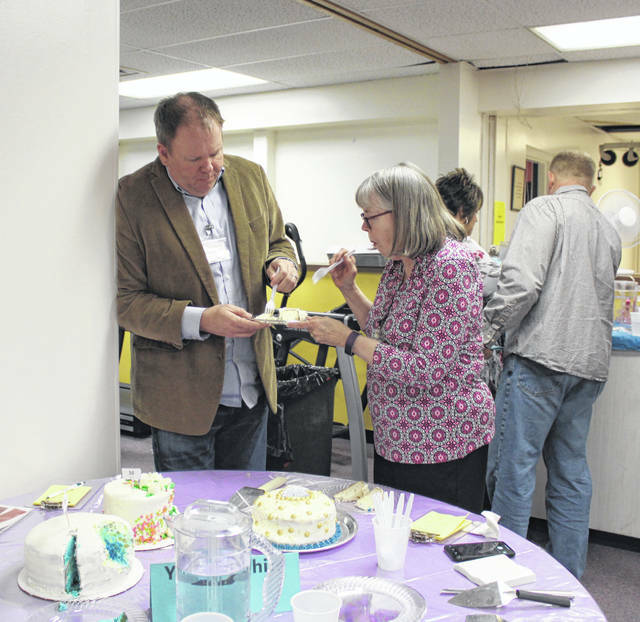 This is expected to be the last time this event is celebrated in the current location as the agency prepares to move to its new location in Middleport at The Blakeslee Center.